So here's the shape of things to come - the Addressing History project has just launched a beta site at http://addressinghistory.edina.ac.uk/. This site has one heck of a lot of potential so well worth exploring and providing feedback on. The site basically links street directories and contemporary maps for three years - 1784, 1865 and 1905. You can search for individuals and locate them on the maps, as well as see the corresponding Post Office Directory entry on the relevant page at the Internet Archive. The potential of this is simply enormous, and if successful, the project partners at the University of Edinburgh, JISC and the National Library of Scotland are planning to extend the concept across Scotland, utilising the info from some 400 directories from 1783-1912 currently being digitised for the Internet Archive (www.archive.org). Please have a look and give the team your constructive feedback! We’ve just added 341,888 records and 1,928,868 images to our Chelsea Pensioners collection for the period 1901-1913. This completes the WO97 series of our Chelsea Pensioner collection and brings the total amount of these records and images on findmypast.co.uk to 1,033,845 records and 6,131,443 images. This collection comprises records of men pensioned out of the British Army 1760-1913. The connection with ‘Chelsea Pensioners’ is that the pensions were administered through The Royal Hospital at Chelsea. For the first time on-line, in colour, you can now see Territorial Force attestations. The Territorial Force was formed in 1908 and so these men would not have appeared in earlier record releases. Also for the first time, you can view – in colour – attestations for men who joined the Volunteer Service Companies during the Boer War. These men, who had previously served with Volunteer battalions, re-enlisted with these special volunteer service companies and served alongside regular soldiers in the regular regiments. Still to come are records for WO 96 (Militia records), which will be made available this time next year. The National Archives is today launching a new Open Government Licence, which makes it faster and easier than ever before to re-use public sector information. The UK Open Government Licence is a key element of the Government's commitment to greater transparency. It provides a single set of terms and conditions for anyone wishing to use or license government information and removes some of the existing barriers to re-use. Developers and entrepreneurs wishing to use government data to create new websites and applications will no longer need to register or formally apply for permission to re-use the data. The new licence is interoperable with other internationally recognised licensing models, such as Creative Commons. The licence covers a broad range of public sector information, including Crown Copyright, databases and source codes and can be used across the entire public sector. It is published today in a machine-readable format on the Information management section of The National Archives website. To support the UK Open Government Licence, The National Archives has developed the UK Government Licensing Framework which sets out the Government's overall policy on licensing and the re-use of public sector information. •identity documents such as the British Passport. It's nice to have news about a major heritage attraction soon to be opening just minutes away from my house! Portencross Castle in North Ayrshire is to reopen to the public after 650 years, following final renovation work carried out last week by Stone Engineering. The building has just undergone a 15 month restoration, and will be open for public access from October 3rd-13th. It is then hoped to be fully open in summer 2011. The castle was one of the contenders for the BBC's "Restoration" series in 2004, in a programme produced by a friend of mine, Andrew Thompson, in which it came second. Following the programme the site was able to attract funding from various bodies including Historic Scotland and the Heritage Lottery Fund. One of a pair of stone towers (the other is on the island of Little Cumbrae) designed to guard the Clyde waterway, and frequently visited by Robert II amongst others, for the last few years it has provided my family and myself with a quiet wee picnic spot. I can't believe they went to the bother of actually renovating the place for us, that's just awfully nice of them! Friends of Portencross Castle is very grateful for the vital support of the public by way of donations and attendance at fundraising events. If you would be willing to give more regular support, then please consider becoming a Guardian of Portencross Castle. Most of the Guardians pay small monthly amounts, as little as £2.50, by Bankers Standing Order. You could pay more if you wish. The income from small tegular payments is very valuable to the long term FOPC Business Plan and helps to safeguard the future of the castle as a high quality visitor attraction and cultural resource. Or you might prefer to make a one-off payment (currently £200), to become a Guardian for Life. Some people give this as an interesting and unusual gift for a special occasion. * A Certificate of Guardianship. * Entry in the Book of Guardians, to be kept in Portencross Castle, arranged according to birthday (year optional). In honour of your support, the flag will be flown above the castle each year on your birthday. To become a guardian visit www.portencrosscastle.org.uk/documents/guardian_leaflet.pdf and for more on the castle itself, visit www.portencrosscastle.org.uk. The First World War - 1914-2010? Cheshire BMD celebrates its tenth anniversary on 15th October 2010. From its small beginnings in 2000 it has continued to grow steadily over the years as volunteers from the Family History Society of Cheshire work with the local register offices to put online the birth, marriage and death indexes based on the original records held by the local register offices. Over the years eight other regions of the country made use of the free UKBMD software and therefore have web sites that function in an identical manner. All of these are accessible for the main UKBMD web site at www.UKBMD.org.uk. When you click on the "Local BMD" button in UKBMD's menu you will be shown a list of links to all the sites that use the UKBMD software, and also all the other sites that are placing their original BMD indexes online using differing systems. Now as the project reaches its tenth anniversary the UKBMD project is pleased to announce the launch of the tenth web site to use the UKBMD software, Cumbria BMD indexes are now online ! As with the other BMD projects this is a joint effort between the register offices and various family history societies. Its initial launch will include data from the Barrow register office with other offices in the area adding their data soon after. "It is with eager anticipation and excitement that I await the launch of the Cumbria BMD website. With all the indexes being transferred from my office I am glad that the new site will be open to the public, which I hope will enable us to provide an enhanced service for copy certificates direct from the original source and also a better tool for the public to search not only for their own certificate requirements but also for family historians to do their research. Having spoken with other Registration staff around the country, who already have their indexes on the other BMD sites, I know it has helped them enormously in being able to provide a much better and quicker service to the public." As stated above, the software used in the UKBMD web sites is free for any society and register office to use. If your area of the country does not have their indexes online yet, perhaps it would be a project that your society would consider? Family Historians gain by having access to original BMD indexes, registrars gain by being able to supply copy certificates without needing to search. Everyone wins ! UPDATE: The link is active but records will not appear on the site until October 15th. The www.familysearch.org website is currently the host site for the International Genealogical Index, but by the end of this year, it will have ceased to be, it will have gone to meet its maker, it will be an ex-FamilySearch site, as its role is replaced by the work currently being produced for the new http://beta.familysearch.org site. This has been on the cards for some time, but the complete programme of what will change, and how and when it will do so is now available to read online at The Ancestry Insider blog at http://ancestryinsider.blogspot.com/2010/08/familysearch-in-corner.html. Whatever people may think of the theological drive behind the work of the Church of Jesus Christ of Latter Day Saints, it will be a brave person who can honestly say that the site has played no part ever in their research. It is quite frankly unique, and one heck of an achievement. Sadly, it is now also about to be deemed obsolete, with the torch pased to a next generation of website which it is said will enhance what is already available, and perhaps correct some of the mistakes that blighted it in the past. Whether the present site as it currently exists will ever be granted some form of vicarious baptism is for others to decide, but in any case, when the current site serves its last day and is replaced the day after, many web users will probably begin to feel just that little bit older...! The whole ceremony was rather impressive. I don't know precisely what religious beliefs the various members of the family now have about the spirits of ancestors. But at the least, even for the most secularised, it represented a profound respect for the continuous achievements of the Chinese tradition, expressed in and disciplined by its main social organisation, the family. Here's a real shock to the heritage system. A 16th century archway leading to historic Scone Palace in Perthshire has been totally destroyed by a contractor - and I mean totally destroyed. NB: This includes the 2nd part of the Collection, which includes the Dundee Courier - this is not available via the pay-per-view 19th century site as yet - so honestly, get in quick! One of the earliest and most significant collections of oblique aerial photography of the United Kingdom is to be conserved, digitised and made publicly accessible thanks to a Heritage Lottery Fund (HLF) grant of £1,755,722. RCAHMS, along with English Heritage and the Royal Commission on the Ancient and Historical Monuments of Wales, will use the funding to undertake a four-year conservation programme on the oldest and most valuable photographs in the Aerofilms Collection and make these images available freely online. Acquired for the nation in 2007, the Aerofilms Collection of over 1 million photographs dates from 1919 to 2006 and presents an unparalleled picture of the changing face of Britain in the twentieth century. From shots of the RMS Queen Mary under construction in John Brown’s Shipyard, Clydebank in 1935, to views of the FA Cup Final at Wembley Stadium in London the same year, the archive is a treasure-trove preserving iconic moments from the history of the nation. The four-year programme starts in 2011 and will involve the general public in sharing memories and information related to the images. Fragile negatives will be conserved and scanned into digital format, and a new website, Britain from Above, will be launched at the end of 2011. By 2014, 95,000 images taken between 1919 and 1953 will be available to view online. Lesley Ferguson, RCAHMS Head of Collections, said “The HLF grant is key to making this fascinating collection accessible to everyone. Aerial photography provides a unique perspective on history and I’m sure the stunning images of both Scotland and the rest of Britain will inspire the public. By interacting with the collection and sharing their memories and wealth of knowledge, they will truly bring the project to life”. An Irish genealogist called Steven Smyrl has been in touch to say he has secured more information from the English 1939 National Register, the accession of which was recently made available to the general public thanks to a Freedom of Information application by Yorkshire based genealogist Guy Etchells which subsequently paved the way earlier this year (see 1939 NHS 'census' to be made available in England and Wales, 1939 update - the decision and 1939 England and Wales: new service at £42 per look up ). Although first created in 1939, the register remained in use until the early 1950s, and contains updates to a person's status from the initial enumeration at the start of the war. In this case, a date of death was requested from the NHSIC, which holds the records. This was rejected, but an appeal was was upheld by the Information Commissioner and the NHSIC was forced to release the date of death in question, which happened in 1948. As part of the NHSIC's response, the body has stated that “in future any requests for information about date and place of death, where we hold this information, will be part of the 1939 National Register Cost Recovery Service”. This service was introduced earlier in the year, whereby a request for look ups from the NHSIC costs £42, with the relevant application form available at www.ic.nhs.uk/services/1939-register-service. Mr Smyrl suggests that if making any applications in future, make sure that you ask for ALL information as recorded in the register. Apparently Belfast is Nashville's sister city - you live and learn! Ancestry.com has announced that its volunteer based World Archives Project is now tackling the indexing of US based correspondence and case files from the country's Immigration and Naturalization Service from 1903-1952. Further details and examples of the material to be keyed are available at www.ancestry.com/wiki/index.php?title=World_Archives_Project:_Subject_Index_to_Correspondence_and_Case_Files_of_the_Immigration_and_Naturalization_Service,_1903-1952. From the same project the Fife, Scotland, Voters Lists, 1832-1894 are now complete and awaiting a release date, as are other potentially useful projects, such as an Index of Jews Whose German Nationality was Annulled by Nazi Regime and London, England, Land Tax Valuations, 1910. Chalmers General Biographical Dictionary has also just gone live at Ancestry.co.uk - see http://search.ancestry.co.uk/search/db.aspx?dbid=7077. On Saturday 25 September from 10am to 5pm, RCAHMS is showcasing historic images from its National Collection in a remarkable illustration of the Victorian era. Our Doors Open Day event will open with a series of presentations by RCAHMS Head of Collections Lesley Ferguson, focusing on photographs of Victorian Scotland. She will also talk about the work of the amateur photographer Erskine Beveridge, whose stunning collection of 850 glass plate negatives - held at RCAHMS - recently featured in our best-selling book 'Wanderings with a Camera in Scotland'. RCAHMS Architecture, Industry and Maritime Manager Neil Gregory will discuss how and why RCAHMS records Victorian buildings, and there will also be the opportunity to see RCAHMS films and exhibitions. Visitors will get the chance to take behind-the-scenes guided tours to access the expert knowledge that goes into our survey, photographic and conservation work – but be quick as spaces will be limited. In our Search Room, visitors can explore fascinating photographs and unique family albums of Victorian people and places, as well as viewing historic and modern images from the National Collection of Aerial Photography, some of them in stunning 3D. You’ll also be able to purchase framed prints of evocative photographs taken by Erskine Beveridge that featured in a country-wide exhibition in 2010. An ex-detective from Lothian and Borders Police is studying at the University of Dundee's postgraduate genealogy course in order to lead the new Banffshire Family History Centre based at Buckie. Just a quick heads up to say that the 1997 BBC history series War Walks, featuring Professor Richard Holmes as the presenter, is being repeated on BBC4. I have a lot of very fond memories of the series - I was its researcher! Tonight's episode (7.30-8.00pm) features Hastings. If you miss it, you can catch it again on the BBC iPlayer. The good folks of EDINA have now created a new Twitter page for the Statistical Accounts of Scotland, and each day will be tweeting select entries. After the ScotlandsPeople website, this is one of the most important resources online, hosted at http://stat-acc-scot.edina.ac.uk/sas/sas.asp?action=public&passback= The first two accounts were recorded in the 1790s and the 1830/40s and describe life in each parish, with a great deal of useful info to help build up the social historical landscape within which your ancestors lived. Unmissable. A big thanks to Alloway and South Ayrshire FHS for their hospitality last night. I was at the society to give a talk on DNA and its potential uses in genealogy (basic summary:- Y-DNA tests, very useful, so many practical applications, but not always a magical solution to problems: MtDNA tests, don't bother, you'll die before it becomes useful! ; autosomal DNA tests, new, exciting, perhaps limited usefulness for most people, but new kid on the block to keep an eye on). There will be an information evening hosted by the society on Tuesday September 28th September at the IFE Wing Doonfoot Primary School, from 7.30pm-9.30pm "aimed at showing what we can offer to all those interested in researching their family tree by becoming a member". If you're in the area, why not pop in?! Posing like my life depended on it - and take that back, I've lost half a stone in the last month! The London based Irish Genealogical Research Society is offering ten free memberships for undergraduate and masters students, and for a maximum term of four years. The application deadline is December 30th 2010 for 2011 membership - there are more details at www.igrsoc.org/student.html. The page does not state which discipline you need to be studying, it merely states that "you will need to demonstrate an interest in Irish genealogy and Family history". How this is to be evaluated is actually unclear - the application form merely states that you should give a "brief statement in support of your application", along with your personal details and those of the course you are studying. I suspect entries merely stating "I love my mum" with a nice cheesy photo of you and your mater at your wedding may not be considered a heavy enough burden of proof! Nevertheless, if you do decide to go for it, membership will include four free academic journals a year on Irish matters, two newsletters and access to certain library facilities in London. The Association of Professional Genealogists (APG) announced today that it will participate in the Who Do You Think You Are? LIVE 2011, The National Conference, this coming February in London. The APG will exhibit at the event, with the goal of educating new audiences on the benefits of hiring professional genealogists who adhere to genealogical standards and ethics. The APG’s international committee has been exploring the growing need for professional genealogists in markets outside of North America. The committee, with members in England, India, Ireland, Israel and the U.S., examines opportunities to share the APG message and promote international awareness of, and interest in, professional genealogical services. The upcoming exhibition will be the APG’s first conference presence outside of North America. The Association of Professional Genealogists (www.apgen.org), established in 1979, represents more than 2,000 genealogists, librarians, writers, editors, historians, instructors, booksellers, publishers, and others involved in genealogy-related businesses. APG encourages genealogical excellence, ethical practice, mentoring, and education. The organisation also supports the preservation and accessibility of records useful to the fields of genealogy, local, and social history. Its members represent all fifty states, Canada, and thirty other countries. I don't think I have ever been as busy as I have in the last couple of months, but that does not mean that I still can't get the odd moment of personal family history research in! I've just received the papers of my grandmother's membership of the Order of the Eastern Star from my father. They are in a sorry state, but include a diploma she was awarded in November 1922, just after she had turned 18, and her life membership card from the following month. My grandmother, Jean Currie, was born in Bridgeton, Glasgow, and moved to Northern Ireland in the mid 1930s, settling initially in Belfast and then moving to Carrickfergus, where I was subsequently raised some years later. I have posted copies of her Eastern Star documents here - she was in Bridgeton No. 88 Chapter. I have not been able to find anything about the chapter online, though have made enquiries of their head office in Glasgow earlier today. However, if anyone knows anything about the order's history in Scotland, and perhaps of the Bridgeton chapter, I would love to hear from you! 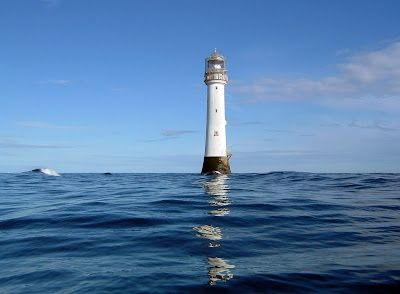 On February 1, 2011, it will be exactly 200 years since the first beacon of light shone out from the Bell Rock Lighthouse, warning passing vessels of the treacherous reef lurking below the waves, 11 miles off the east coast of Scotland. The Bell Rock Lighthouse is widely considered one of the world’s greatest feats of engineering and has protected the lives of innumerable seafarers. “Before the lighthouse was built, the Inchcape or Bell Rock had claimed countless vessels,” explained David Taylor, editor of the highly-informative website www.bellrock.org.uk and whose great-great-great-grandfather, Captain David Taylor, was closely involved in the construction of the Bell Rock Lighthouse. David added that, although the Northern Lighthouse Board's young engineer Robert Stevenson had already put forward plans for a lighthouse on the Bell Rock, it was decided that the construction techniques used by John Smeaton some 50 years earlier at the Eddystone would be the blueprint for the new lighthouse, with certain modifications. “John Rennie was appointed chief engineer to the project, with Stevenson his resident engineer and assistant,” continued David. “Rennie adopted a narrower structure than those shown in Stevenson and Smeaton’s designs, with the all-important curve at the base of the lighthouse which dissipates and deflects the force of the sea as it comes into contact with the tower." Constructing the Bell Rock Lighthouse was a massive undertaking. The reef on which the lighthouse was to be built was only visible for a few hours a day and work was also severely restricted by the weather and the seasons – the winter months were so stormy, working on the Bell Rock was only possible between April and October. However, after only four years, the Bell Rock Lighthouse was completed and it became operational on February 1, 1811. There are many links between the town of Arbroath and the Bell Rock and its lighthouse. Legend has it that, in medieval times, the Abbot of Aberbrothock – as Arbroath was originally known - warned sailors of the deadly rock by placing a bell on the Inchcape Rock, only for it to be removed by the dastardly pirate, Ralph The Rover, who later came to a well-deserved watery end on the Bell Rock! Many of the blacksmiths, builders and masons who were involved in the construction of the Bell Rock Lighthouse - both off-shore and at Arbroath Harbour, where the great stones were cut to size before being transported to the Bell Rock - were from the town. Arbroath’s Signal Tower Museum was formerly the shore station for the lighthouse and housed the lighthouse keepers and their families although, in the final years before the Bell Rock light was automated in 1988, it was serviced and its keepers relieved by ships from Leith. For more information, visit www.angusahead.com/bellrocklighthouse. 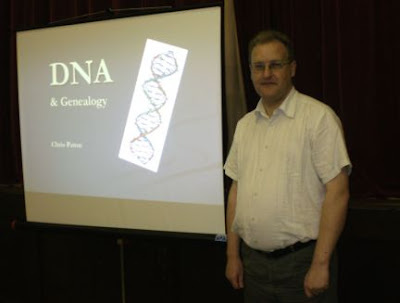 A quick heads up to say that if you have nothing to do tomorrow night and you are in Ayrshire, I will be doing an introductory talk at Alloway and Southern Ayrshire FHS on DNA and Genealogy - specifically the basic ideas behind it, where it can be used, how it can be helpful and recent developments - but also where to be wary of it as a 'magic solution' to your brick wall problems. For details see www.asafhs.co.uk/events.php. On October 5th I will be doing a talk on Online Irish Resources for family history at West Lothian FHS - this one is usually packed when I do it! For more on this see the Syllabus page at www.wlfhs.org.uk. I may be wearing a black arm band on this night, as three hours after it finishes I turn 40...! From October 18th-25th I will also be doing a Scottish talks roadshow in Australia. These will include a basic introduction to Scottish research, and also closer examinations of land and church records, and will be held at family history societies in Perth, Melbourne and Brisbane in Australia, as well as at the Sydney Expo on October 22nd-23rd - further details at www.unlockthepast.com.au/events/history-genealogy-expo-sydney-2010/speakers and www.unlockthepast.com.au/events/chris-paton-australia-scottish-roadshow. Following that, I will also be doing a talk at Lanarkshire FHS on the Mount Stewart Murder, the subject of my next book and the UK's longest unsolved murder case. The victim was my 3 x great grandmother. This will be on November 11th, and will basically examine the anatomy of a Scottish Victorian murder investigation, how to research its progress and its consequences (there's a real sting in the tail with this one). It will not just confine itself to the murder, there will be other examples included also. Further details at www.lanarkshirefhs.org.uk/news.html. Look forward to hopefully seeing you somewhere along the line...! Secular society? No, the worship of Burns continues! This week has obviously been a big week for the Scottish Catholic Church, with the arrival of the Pope in Edinburgh. Although my wife and children are Catholic, I was actually raised as a Presbyterian in Northern Ireland, though am no longer that religious at all. For me, once we go, that's it, and hence why I think the recording of our family history is so important, as it is probably the greatest gift we can leave the next generation. However, the Pope did warn that Scotland is becoming dangerously secular. That may be worth challenging. You see, it is quite clear that the Government's worship of Robert Burns is actually alive and well, and clearly on the increase. If you don't believe me, read the press release quoting Culture Minister Fiona Hyslop, where she has announced yet another £1.084 million to the new Robert Burns Museum in Alloway, now taking the Government's spending on the £21 million project to some £8.6 million. The reason why this strikes a chord with me is that Government minister Jim Mather has also just announced that he has asked the National Archives of Scotland, the General Register Office for Scotland and Registers of Scotland to consider merging to save money. As a genealogist, I have to say that I know which I think probably gives better value for money. I may not be the religious man I once was, but one aspect of Presbyterian theology has always stuck with me - the fact that in the Bible there is no mention of a moral authority for the raising of one man in a hierarchy above another. Presbyterians have long argued that that does not justify the role of the Pope - to me however that also applies equally to John Knox (is the statue of him on the Mound in Edinburgh the true definition of irony?! ), and let's face it, the establishment's continual obsession with Robert Burns! Looks to be an interesting talks schedule, with many family history socities exhibiting (sadly I'll be in Skye running away from my 40th, but hope it goes well!). Glasgow University Archives - the movie! Glasgow University Archives are packed with goodies galore. Damn, but there is so much going on there - business archives, university records and so much more - if only there was a handy dandy ready reckoner of a film, say about 8 minutes and three seconds long (any more and I'm just being greedy! ), that will tell me everything I need to know about such an institution. But where, oh where, might one find such a gloriously useful production...? Get the popcorn out folks, pull up a pew and get ready for the university archives' first ever feature production...! Thank you for your e-petition on costs for certificates from the General Register Office (GRO). The fee changes you refer to were introduced from 6 April this year following a comprehensive review of existing fees which took place during 2009. The Government has an obligation to ensure that the income from GRO fees recovers the cost of providing the service, and the review concluded that the increases (the first since 2003) were now necessary to recover those costs. The changes introduced in April were also aimed at simplifying the previous fee structure, reducing the number of types of fees from 8 down to 2. Although the cost of the cheapest certificate – those ordered online with an index reference number – rose from £7 to £9.25, some of the previous fees were reduced, for example for those ordering by telephone or post without an index reference number. We recognise the important role played by genealogists and appreciate that they will be disappointed by the recent fee increases but the recent fee changes will help to maintain the efficiency and quality of service to customers, and both the processes involved in this and the fee structure itself will be subject to future review. The petition also refers to certificates being sent by email to reduce costs. Under current legislation GRO may only provide copies of entries by means of a paper certified copy. 1911 Scottish census - sneak preview! Those lovely folk at the ScotlandsPeople Centre have very kindly allowed me to show you a sneak peak of the 1911 Scottish census, which will be released in April of next year. 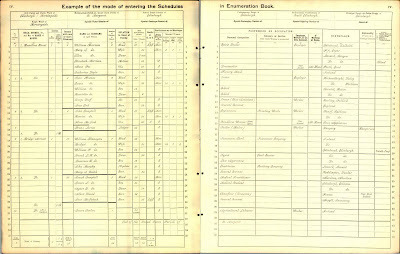 The first thing to point out is that this is NOT an image from the census, but instead a guide page sample for enumerators who were asked to fill out the actual forms once the original household schedules had been filled in by the head of every household. So PLEASE don't write to them asking to see your great granny's record just yet - it just won't happen...! Nevertheless, when the records are released next year, this is the format in which they will be presented. The eagle eyed amongst you will notice one very huge difference to this and the 1911 census' English, Welsh and Irish counterparts. Whereas elsewhere in the United Kingdom the original household schedules have been preserved, digitised and made available online, the equivalent household schedules for Scotland have unfortunately not survived. So when the images are released, you will instead see the enumerators' returns, as with previous decennial census releases, but running at two pages in length, as opposed to one with previous entries. However, all is not lost! Whilst your great grandfather's bad handwriting may not be accessible to ponder over, the information contained within the enumerators' returns will in fact be very similar to that found in the front pages of other British 1911 census returns. The column on the right hand side of the first page asks the same 'fertility census' questions for married women - how many years married, how many children, and how many still alive. The question of proficiency in Scottish Gaelic (Gaidhlig) and/or English is also retained, and the number of rooms with one or more windows is surprisingly noted in one of the earliest columns on the first page, rather than to the right hand side. There are four columns dealing with occupation on the second page, and I had been told from one source that those with Irish ancestors could be in for a treat as the county of birth was said to be noted - however, in this example page two mythical Irish people have had their birthplaces simply noted as 'Ireland', so I guess we'll have to see how that one plays out! At present there is no information available on how these returns will be priced, but it is the intention that they will be made available on both the ScotlandsPeople website (www.scotlandspeople.gov.uk) and the ScotlandsPeople Centre (www.scotlandspeoplehub.gov.uk) via a simultaneous release next April, which I think may be a first for a records release in Scotland. Don't say I am not good to you - and roll on next year's release of the Scottish 1911 census! NB: For a closer look, please visit the Scottish GENES Facebook page! The Irvine Herald is reporting that the Irvine Burns Club is poised to takeover the Glasgow Vennel local archive and family history centre in Irvine, to use as a winter museum - the premises are where Burns learned the flax trade. Very handily for me, as it will be just down the road, the present centre and archive will be moving to Saltcoats next month. As such, the Vennel will be closing from this Saturday 18th September in preparation for the move. The full story can be read at www.irvineherald.co.uk/ayrshire-news/local-news-ayrshire/local-news-irvine/2010/09/17/irvine-burns-club-set-to-takeover-vennel-museum-75485-27272292/. Looking forward to seeing the new facilities! The Maps Reading Room will be moving, with the new room due to open on Tuesday 21 September. We will remain in the same building, but move to street level, so there will no longer be any stairs to climb! Our bright new entrance will be round the corner at 159 Causewayside. The move will take place over the September holiday weekend. The Reading Room will be closed from Saturday 18 to Monday 20 September inclusive. We hope to minimise disruption as we prepare for the move. We are re-organising our reading room material in advance. Some of this, along with desks and shelving, will be moving during September. We apologise for any inconvenience, and we hope that you will come and visit us in the new reading room. Our email address and telephone numbers will remain unchanged. If you would like any further information, contact Maps Collections or email maps@nls.uk. The Irish Family History Foundation's Online Research Service (ORS) are pleased to announce the availability of the records from Irish Midlands Ancestry covering the parishes of County Laois (Queens's County) and County Offaly (Kings Country). This adds another 800,000 records to our online database. Just go to the following sites and login using your existing IFHF login details. In 1850, Margaret Bannaghan was convicted of robbery in Edinburgh, Scotland, and sentenced to "be transported beyond the Seas for the term of Ten Years." In 1854, after four years in prison, Margaret was essentially paroled when she was granted a "License to be at large in the United Kingdom" during the remainder of her sentence. The database includes images of the records themselves, which make up a file on the convict. Their contents varies but can include next of kin, religion, literacy, physical description, a medical history, marital status, number of children, age, occupation, crime, sentence, dates and places of confinement, reports on behavior while in prison, letters or notes from the convict, and (from 1871 forward) a photograph. This collection consists of registers and letter books of prisoners on convict prison hulks in England between 1802-1849. A hulk is a decommissioned ship that is either technologically out of date or cannot make it through the open sea without taking on water, but is still able to float without problems. There were many of these ships available when engines started to power ships instead of sails, so the hulks were moored in harbors and used as floating prisons or for other purposes. The hulks’ place in harbors also made it easier to hold and transport convicts being sent to Australia. The first prison hulks in England appeared after a 1776 act allowed them to be used to house prisoners. The collections are available at www.ancestry.co.uk. Another English GRO bird to be shot down? Many readers may be aware of the fairly disastrous attempts of the English and Welsh General Register Office's civil BMD records to be digitised and reindexed over the last few years, with various projects such as DOVE, MAGPIE and EAGLE being announced in a blaze of publicity and then duly shot down due to problems with contractors and more. Rumours that the project management has been as birdbrained as the project titles can truly not be substantiated, but it is the case that not one of the projects is flying any more, having been abandoned only half completed and after a lot of taxpayers' money spent. The Digitisation and Indexing Project (D&I) is the project to scan and digitise birth, marriage and death registration records for England and Wales from 1837 to present day. As well as the digitisation of the records themselves, the project includes the creation of an online index to the records and an upgrade to the online certificate ordering process. The D&I project is currently in a pause status as IPS awaits the outcome of the government's Comprehensive Spending Review (CSR). It is possible that the outcome of the CSR will impact the overall scope of the project, as well as timescales and procurement activity. Further updates will be posted on this page, as soon as information is available. So, once again, it has been stopped, and in a recession where the Government looks just about ready to go all medieval on our posteriors, it does not look good for a new improved English and Welsh system anytime soon. It is worth mentioning that this project was never going to be a ScotlandsPeople type scenario, with digitised images being made available online, but merely a way to provide better indexes and quicker certificate dispatch times. But you do have to wonder why one UK based GRO can find a perfectly adequate way to make its records accessible and another can constantly keep finding perfectly adequate ways to keep landing on its aforementioned posteriors. Thanks to Sheena Tait for her blog post on the new LothianLives blog at http://lothianlives.org.uk. The blog has many useful historic resources and insights into the lives of those from the three Lothians, as recorded in material held by the relevant local archives (City of Edinburgh, East, Mid and West Lothian Archives). Well worth a look. Well that's me back from the National Family History Fair at Newcastle, after a great couple of days in the city. I travelled down on Friday to do some client research at the new Newcastle Library facilities - an amazing place! I spent many hours going through old trade directories, electoral rolls and all sorts of material, a great place to do research, and I look forward to a visit to the city archives soon. The fair itself took place yesterday, at a new venue, the Tyne Suite of Newcastle Premier Inn. The event was a tad smaller compared to that held at the previous venue in Gateshead, but had a much nicer feel about it, and much less stressful! It was busy constantly throughout, whereas before the mornings had tended to be busier and then much quieter in the afternoon. I was down to help introduce the three excellent talks given by Amy Sell of FindmyPast, Audrey Collins of The National Archives (Kew) and Jeanne Bunting from Census Detectives. As such I did not have as much of a chance to get around to talk to vendors as in previous years. I did pick up from Sharon and Ian Hartas of UKBMD that a new series of BMD indices for civil records will soon be going online for the Cumbria region which may be of interest to those in the Borders with family just to the south. The lovely folk at the Scottish Association of Family History Societies were also there, and have just produced a new version of The Parishes, Registers & Registrars of Scotland, which is a handy guide with parish maps and more, costing £4 (see http://safhs.org.uk/SAFHS_Shop.asp). I also spoke to Nigel Bayley of S & N Genealogy, who was a happy bunny about a recent piece I wrote on the new Tree View software on The Genealogist.co.uk website, which is a free to access site, and rather impressive. What I didn't know though was that there is now a Facebook app version of this, located at http://apps.facebook.com/tree-view/ - well worth a look. I did bring my new camcorder this time, and had intended to grab a few words with a few people there. Sadly, however, I was only able to grab one quick chat, with Amy from FindmyPast, which is reproduced below. Amy works as a marketing executive with the company, and was lucky enough to join the Battle of Britain memorial flight last week, which FindmyPast were part sponsors for. Amy is a contributor to FindmyPast's blog at http://blog.findmypast.co.uk/. A huge thanks to Amy. Keep an eye out for the new Family and Local History Handbook 13 early next year, and if you can get to Newcastle for the event next year, you won't be disappointed! GROS, NAS and Registers of Scotland to merge?